Dermatology is an intrinsically visual speciality. 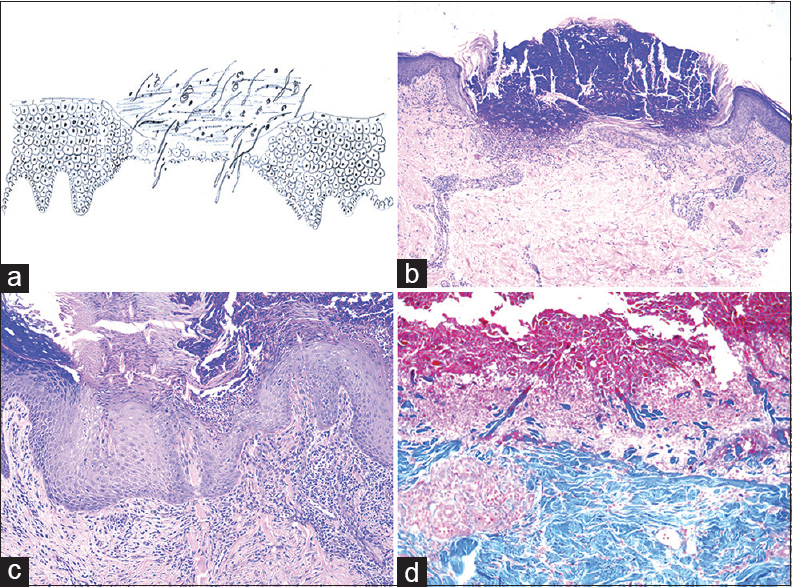 Historically, drawings have been used to illustrate both clinical and histopathological aspects of skin lesions. Pattern recognition is a vital skill for histopathological diagnosis of inflammatory dermatoses. This approach was well illustrated in the textbook written by Dr. Bernard Ackerman that is used universally by all practicing dermatopathologists. “Silhouette” of the skin lesion, observed under scanning magnification, provides an overview of the histopathology and facilitates distinction of closely related conditions. This approach is exemplified in evaluation of cutaneous perforating disorders, the focus of this article. Perforating disorders are characterized by umbilicated papulo-nodular lesions with keratotic plug. To take advantage of the architectural silhouette, the biopsy must include the entire lesion centered over the keratotic plug and surrounding epidermis, best achieved by selecting a small size lesion. The primary perforating disorders, namely, reactive perforating collagenosis (RPC), elastosis perforans serpiginosa (EPS), perforating folliculitis (PF), and Kyrle's disease (KD) will be included in this article. The transepidermal elimination observed in the primary disorders relates to collagen, elastic fibers and keratinous debris. The silhouette is saucer shaped [Figure 1]a. A shallow crateriform epidermal invagination, filled with basophilic debris, neutrophils, parakeratotic keratin, and collagen fibers, is seen [Figure 1]b. Surrounding epidermis is acanthotic. Epidermal base shows variable features ranging from full-thickness necrosis to being partially damaged. Mild perivascular inflammation is seen in the underlying dermis. Diagnostic clue is to locate transgressing collagen fibers. Such fibers can be identified at several spots. Extruding collagen fibers stand out by being vertically oriented at the entry point along the base of the invagination and appearing as a “rocket” streaking through the basophilic keratotic plug. A careful search may show fibers interposed between the keratinocytes at the junction between the plug and intact epidermis [Figure 1]c and [Figure 1]d. Collagen fibers appear pink with H and E and blue with Masson's trichrome stain. Keep in mind that collagen fibers traversing through invagination may lose their staining quality [Figure 1]d.
The silhouette is serpiginous [Figure 2]a. Irregular epidermal hyperplasia forms a curvilinear channel with overlying keratinous plug and neutrophils [Figure 2]b. A bulbous invagination at the base is filled with basophilic debris and coarse clumped thickened eosinophilic elastic fibers [Figure 2]c. The perforating channel can be hyperplastic epidermis, follicular, or sometimes acrosyringeal. Foreign-body giant cell reaction is sometimes noted in adjacent dermis. Elastic stains such as Verhoeff-Van Gieson [Figure 2]d and Orcein show increased coarse elastic fibers in the papillary dermis. Elastic fibers appear pale or eosinophilic as they are eliminated. The best stain for dermal elastic fibers in this condition is Giemsa. Altered fibers in EPS may resemble hyphae of Mucor or Rhizopus [Figure 2]c. The lesion heals with a dermal scar that is devoid of elastic fibers. Papular lesions with central scale of EPS are arranged in annular or serpiginous pattern. Clinical differential diagnosis could include other annular lesions such as granuloma annulare (which may also show incidental perforation), tinea corporis, porokeratosis, and sarcoidosis., All these conditions show distinctive pathology. The silhouette is angulated vase [Figure 3]a. The follicular infundibulum/isthmus is dilated and is filled with necrotic debris, ortho- and parakeratotic keratin, and inflammatory cells [Figure 3]b. The perforation appears along the thinned lateral wall of follicular epithelium [Figure 3]c. Adjoining dermis shows degenerative changes and sometimes, eosinophilic collagen and/or elastic fibers are seen entering the perforation. Hair shaft may be seen within the follicle as curled up or trapped within the debris. Disruption or break of the follicular epithelium along lateral border should be noted. Sometimes, one observes thinning of the epithelial wall, which is the likely site of perforation, surrounded by inflammatory infiltrate, a mix of neutrophils and granulomatous infiltrate. It is possible that the initial sections will not reveal the follicular pathology in its entirety. In the absence of follicle in the section, the clue to presence of follicular pathology will be a localized area of inflammation in the dermis. Differential diagnosis includes keratosis pilaris and various folliculitides. Keratosis pilaris does show dilated follicular infundibula, but perforation is absent. Ruptured folliculitis shows extensive damage to the follicular epithelium and is much more inflammatory. The silhouette is flask shaped [Figure 4]a. On a historical note, the first case was described by Dr. Kyrle in a diabetic woman, illustrated by a fine histopathologic sketch in the original paper published in1916. The round flask-shaped invagination is filled with parakeratotic plug and basophilic necrotic debris [Figure 4]b. Invagination either involves follicle or is epidermal. As the lesion evolves, the basal layer becomes attenuated and usually breaks at one or more points thus exposing the keratinous material to the dermis. Serial sections are helpful in demonstrating the perforation. However, perforation does not always occur and is not an absolute requirement for the diagnosis. Surrounding epidermis is acanthotic. Inflammatory infiltrate of neutrophils at the point of perforation and perivascular lymphocytic infiltrate in the vicinity are seen. An occasional elastic fiber is seen only exceptionally and not as a routine. Clinically, most lesions of KD are follicular based. Thus, the closest differential diagnosis is PF. Histologically, follicular infundibulum containing curled up hair shaft with a perforation along the lateral wall favors PF. The perforating disorders have overlapping clinical and histological features. Furthermore, transepidermal elimination of collagen and/or elastic fibers is common to all perforating disorders. Therefore, silhouette-based pattern is a useful clue for distinction. Cribier B. Medical history of the representation of rosacea in the 19th century. J Am Acad Dermatol 2013;69 6 Suppl 1:S2-14. Ackerman AB. An algorithmic method based on pattern analysis. Histologic Diagnosis of Inflammatory Skin Diseases. 1st ed. Philadelphia: Lea and Febiger; 1978. Wagner G, Sachse MM. Acquired reactive perforating dermatosis. J Dtsch Dermatol Ges 2013;11:723-9, 723-30. Patterson JW. The perforating disorders. J Am Acad Dermatol 1984;10:561-81. Lewis KG, Bercovitch L, Dill SW, Robinson-Bostom L. Acquired disorders of elastic tissue: Part I. Increased elastic tissue and solar elastotic syndromes. J Am Acad Dermatol 2004;51:1-21. Main RA, Dave VK, Carr AJ. Elastosis perforans serpiginosa – A diagnostic measure. Br J Dermatol 1971;85:195-6.